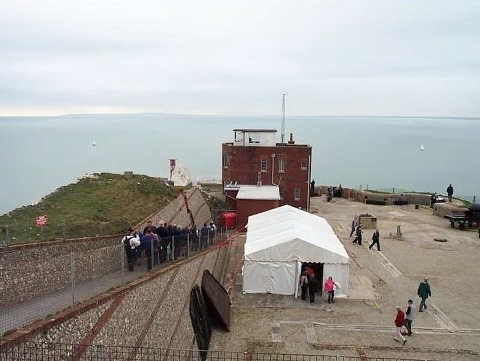 The first was built in 1861/3 on 250 foot cliffs with spectacular views of the Needles and Hurst Castle. 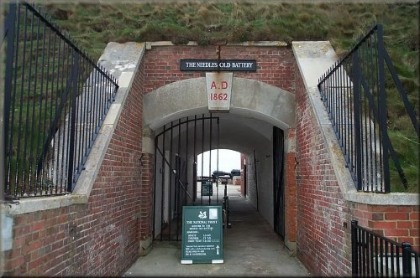 The front of the battery was protected by a dry ditch and movable bridge but the rear had the cliffs as protection. It has many underground tunnels dug during the 1880's. The armament consisted of 6 seven inch guns until the end of the century when these were replaced by more powerful ten inch guns and a second battery was built nearby in 1895. This was equipped with 3 modern breech loading 9 inch guns. The batteries were last used in World War 2 after which they were abandoned until 1975 when they were sold to the National Trust. Part of the new battery is now used as a Coast Guard station.